The café is as essential to the French way of life as the pub in England and both are under threat. 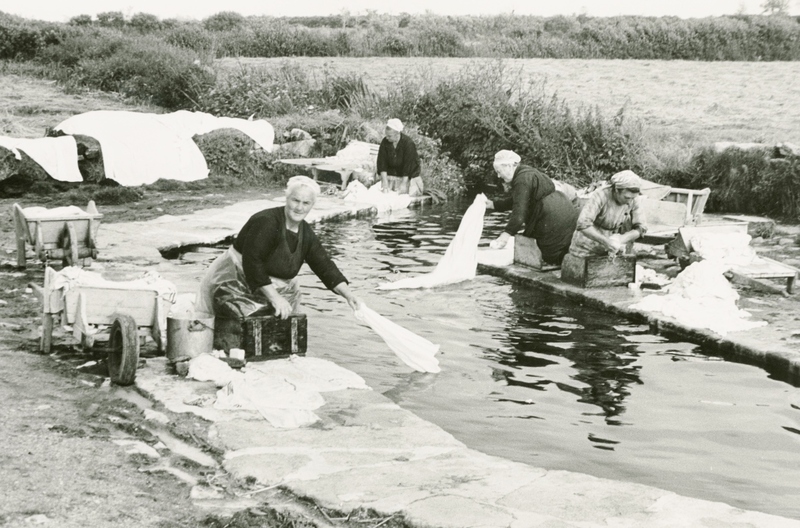 In Lamastre there are still seven, but local people tell us that in the days before motor traffic the town boasted something like thirty watering holes. Of course we are not talking here about the glamorous café terraces of Montparnasse or Aix-en-Provence but simple establishments, which often doubled up as the boulangerie or épicerie. 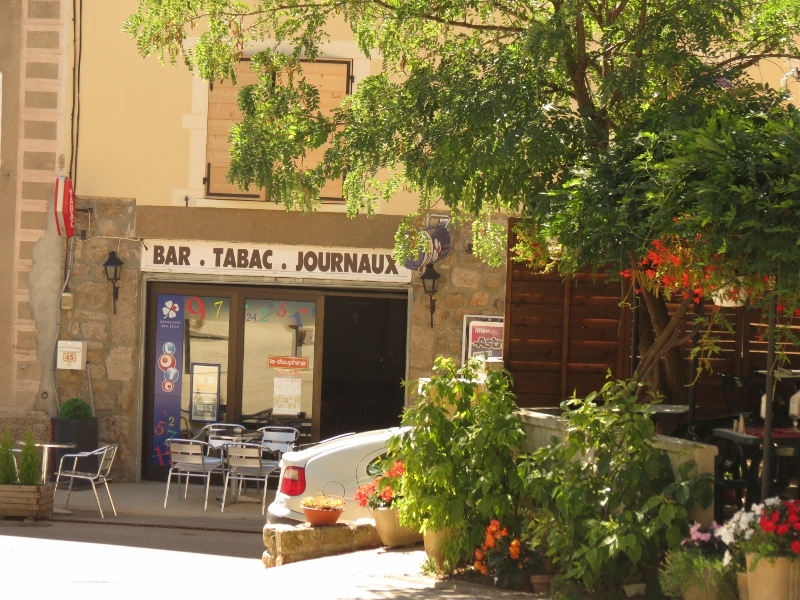 In fact when we first came to Arlebosc there were four such places in the village, only one of which functioned solely as a café. Tougher controls on drink driving together with the ban on smoking in public places have been the death of so many of these little joints. In Arlebosc, the clocheton used to ring the church bell at mid day and then cross the road to join the farmers and local labourers for a glass of something before heading home for lunch. Now the bell is an electric contraption which rings itself and the locals are more likely to get together round a tractor in the farmyard to drink a canon after a hard morning’s work. No doubt we are all healthier and safer on the roads than we once were, but it is also true that a convivial village link has been lost. The more makeshift cafés in Lamastre were on the roads leading in to the centre of town, often just a front room with a few chairs round a table for the customers but always with space somewhere at the back to stable the animals which had drawn the cart in to market. After a couple of nips to warm up on a wintry day, the farmers would take their produce to sell, returning at the end of the morning for another glass or two before hitching up the beasts and setting off on the journey back to their farms in the hills. These trips were often long and hard going for the animals, which might be oxen, mules, horses or sometimes even cows, and refreshment was provided for them too along the way. Flashing past in a car it is easy to miss the drinking troughs which were placed strategically along the uphill stretches, sometimes adorned with a carved figure, or beautifully covered with a stone arch to keep the water cool and fresh. With the arrival of motorised vehicles many roads had to be re routed to avoid gradients which were possible for animals but too steep for the earliest internal combustion engines. 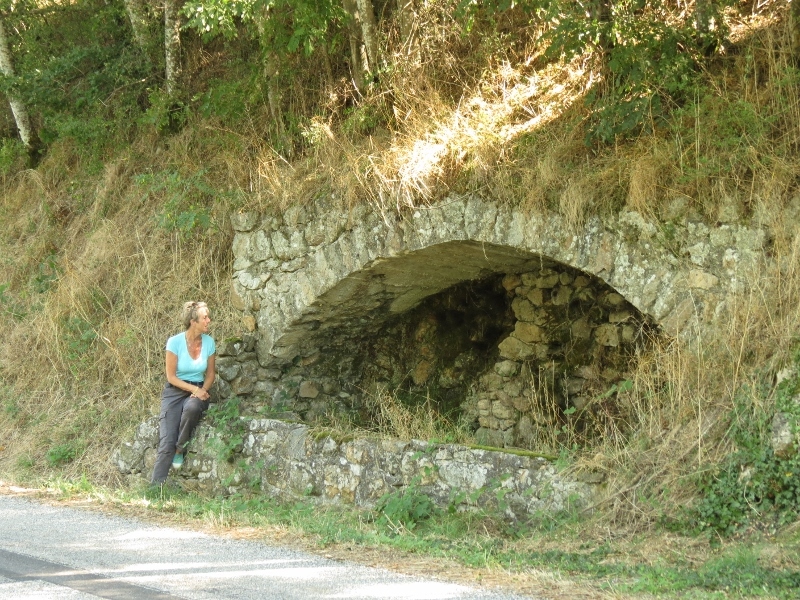 We are always amused by the old road to the village of St Prix. A little chapel stands on the steep stretch before the village, which was apparently built to discourage, or perhaps defuse, the continuous cursing of the carters as their animals laboured their way up the hill! 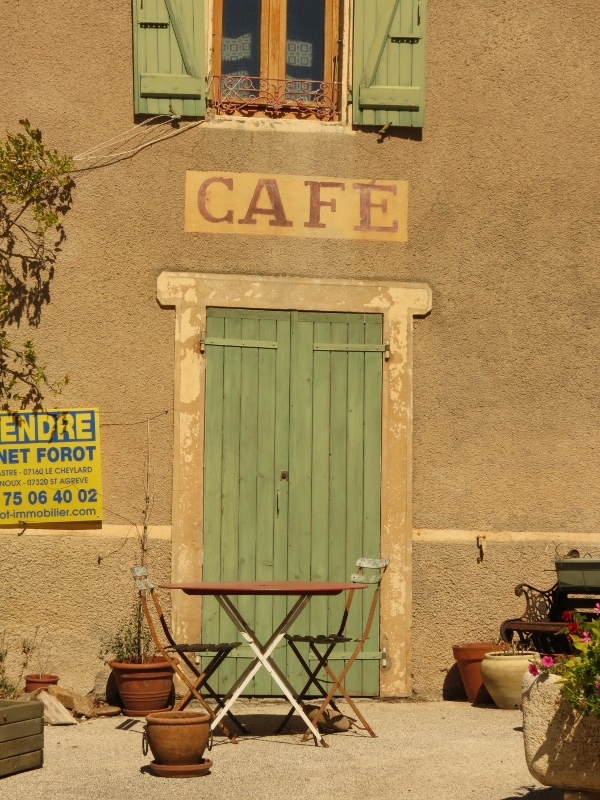 Like the wayside crosses which still mark some intersections, these relics of a slower pace of life and transport are mostly ignored today, but in the attractive village of les Nonnières our friend Isabelle has had a lovely idea. 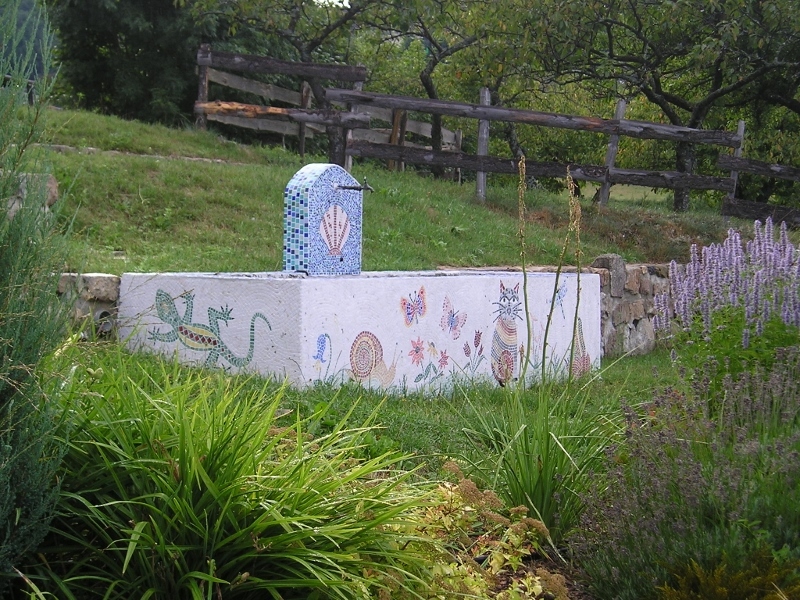 She is a mosaicist and recently got the villagers together to create a special mosaic treatment of this trough, which used to be the communal water supply. The result is a cheerful tribute to these once essential features of country life. As a child on family holidays in France the national obsession with bottled mineral water seemed extraordinary. Water in a bottle – what an idea! How things have changed – in the UK these days there seem to be as many Natural Highland Springs as the supermarkets have shelves on which to stack the bottles and restaurants habitually make a fuss about bringing a jug of water to the table, whereas in France they are legally obliged to provide free tap water. My parents believed that the French drank mineral water because the stuff that came out of pumps and wells was unsafe (although we drank gallons of it and survived) and certainly my early memories of quintessential foreignness involve a heady aroma compounded of Gauloise smoke, pastis, melons . . . and drains. Today there are around 50 varieties of mineral water readily available out of an estimated total number of 200 produced in France. The big names such as Volvic, Badoit and Evian (commercialised by Danone) and Contrex, Vittel and Hépar (by Nestlé) are known worldwide, as of course is Perrier, a naturally carbonated water from the South West, with the wonderful Villemot posters and the timeless slogan Perrier c’est fou! 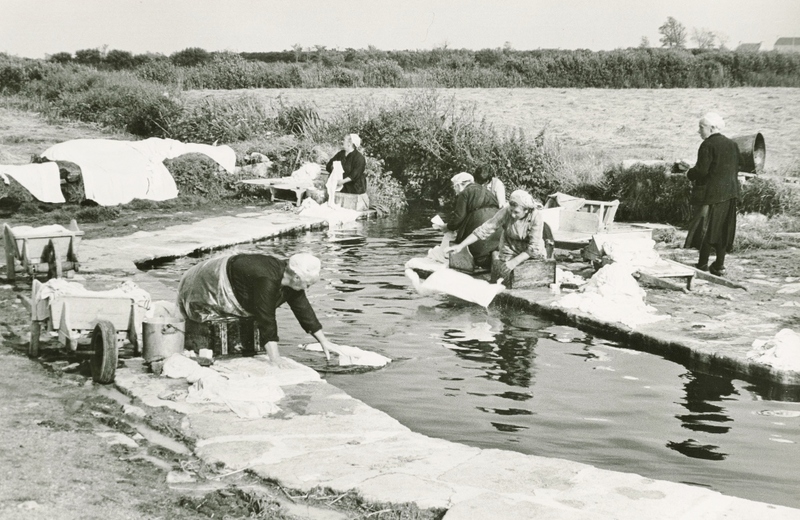 The heyday of small local mineral springs began in the late 19th C, boosted by the European craze for thermal cures. Towns like Vichy became fashionable watering holes for the leisured classes, complete with parks, concert halls, salons de thé and of course the établissements thermales, where the salty water was drunk and all kinds of hydrotherapy provided for the ailments of the age from hysteria to gout. Still today there is a strong belief in the value of such thermal treatments. 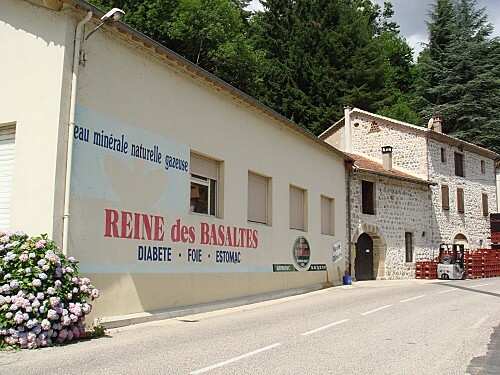 A local friend of ours takes an annual three week thermal cure at Neyrac les Bains in the South Ardèche, where the water has medically recognised beneficial properties for the treatment of arthritis and rheumatism. The cure is prescribed by her family doctor and the cost covered by the French Health Service. But back to the water bottle on the table. When transportation was still a real problem on the endlessly twisty roads of the Ardèche, water was bottled and sold locally in a vast number of villages, each one vaunting the properties of its own brew with reckless abandon and with names such as L’Excellente and La Salutaire from Prades, La Fortifiante at La Bégude, La Suprème, La Férrugineuse Incomparable, and La Reine des Basaltes at Asperjoc. 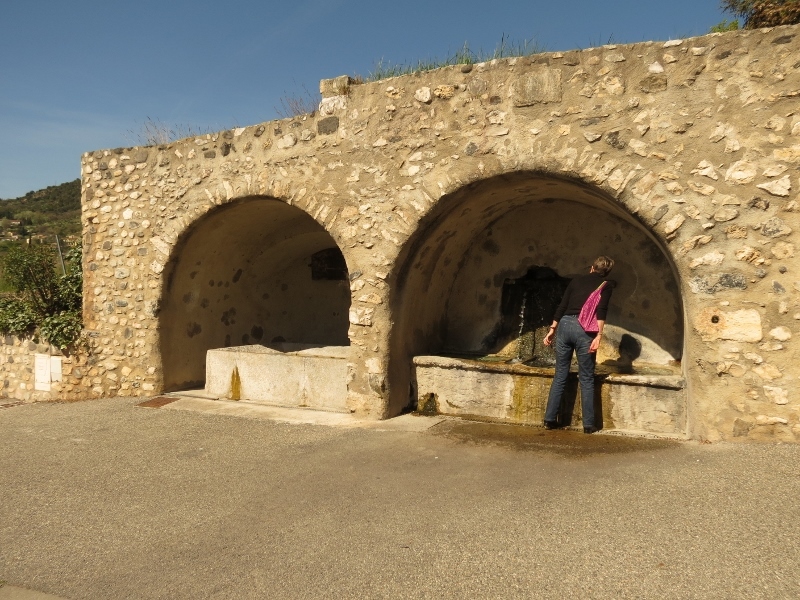 There are at least 65 mineral springs in the Ardèche, but over time many have become blocked or contaminated and in others the flow is too weak for them to be commercially viable. The best known of our mineral waters is Arcens, available nationwide, but recently, perhaps as a reaction to the global giants of food supply, smaller local varieties are making a comeback. 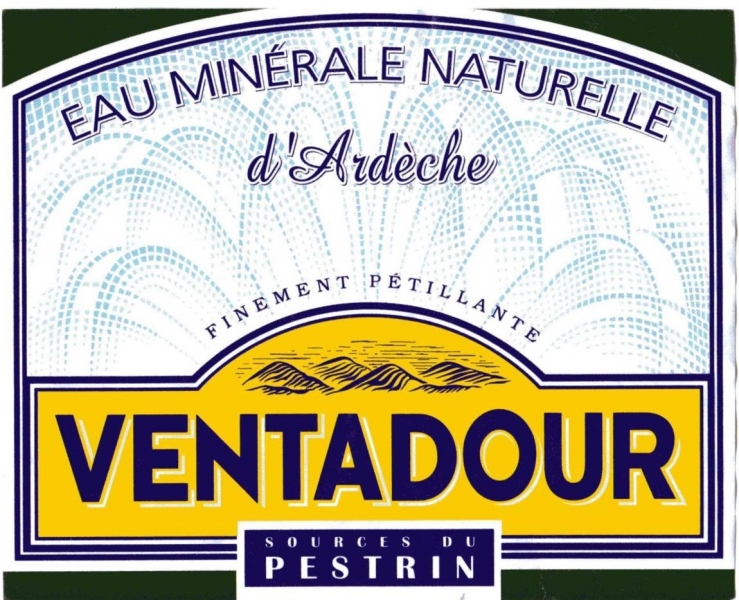 Buvez ardéchois, is the slogan of our micro brewery in Lamastre and this could also apply to the water. The one you are most likely to encounter is the sparkling Ventadour or still Chantemerle (previously known as La Miraculeuse!) from Meyras. One million bottles of these are produced annually. 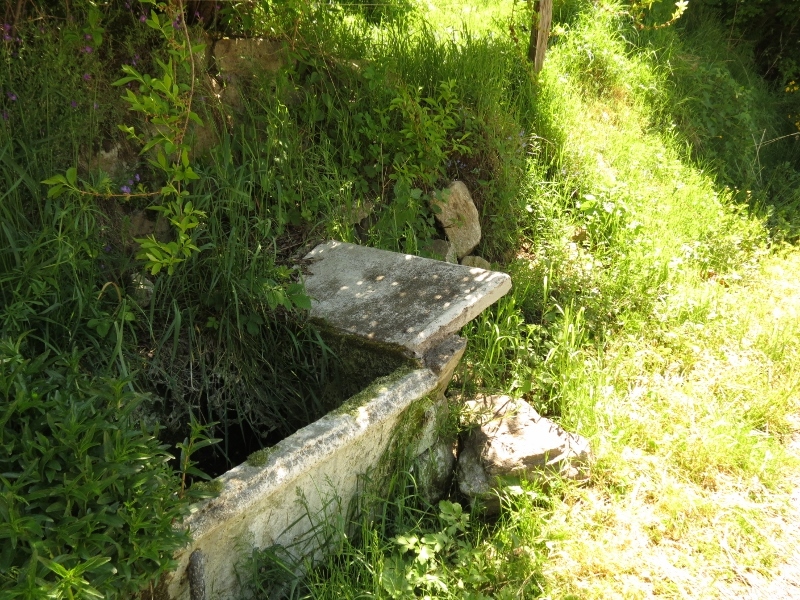 The third spring at Meyras, Pestrin, was allegedly discovered by a troubadour returning from the Crusades who found that the water could cure the peste or plague. On this label from the inter-war years we are urged to take a cure of 5 bottles of radioactive Pestrin to deal with malaria, typhoid, liverishness or general exhaustion! Pestrin was bought after the fall of France in 1940 by Paul Ricard, the incorrigibly colourful inventor of Ricard, le vrai pastis de Marseille. 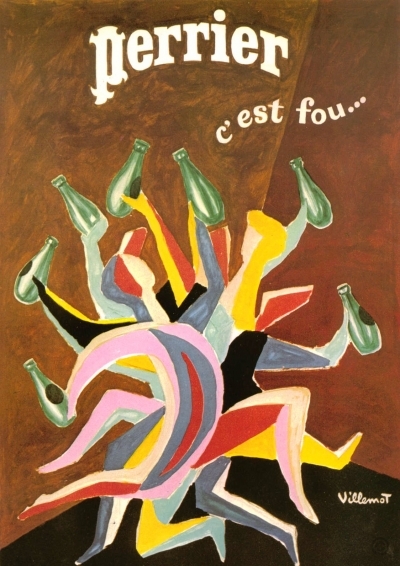 Under the Occupation, as part of its National Revolution policy, the Vichy government outlawed the production of pastis, identifying it as symptomatic of the degeneracy of pre war France. Nothing daunted, Paul Ricard took to growing rice and fruit on his estate in the Camargue, which he distilled into fuel for use by the Resistance! Closer to home there is La Marguerite at Gilhoc, about 8 miles from us, and in Désaignes, César, Faustine and Moise. 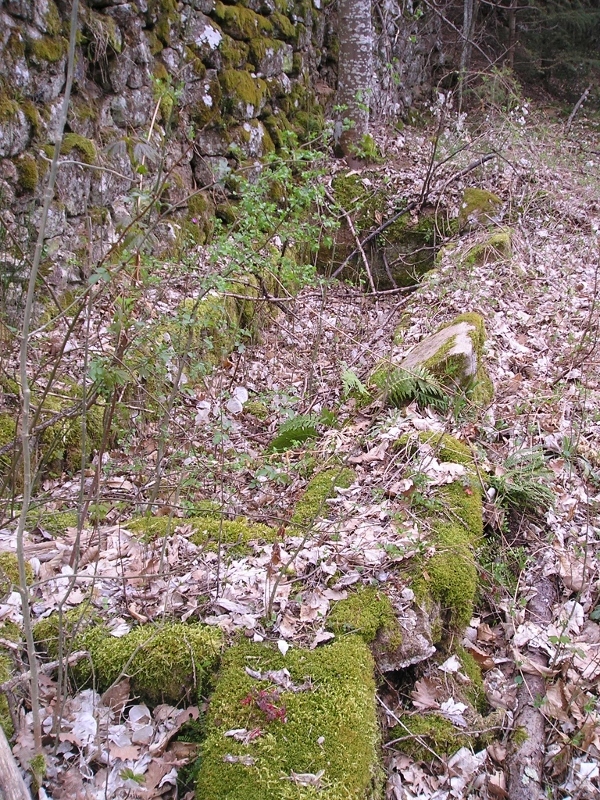 None of these is exploited commercially at present but in 1991 Moise was re bored and there is a project afoot to resume production under an initiative by the Regional Park of the Ardèche to which Désaignes belongs. Actually the tap water at Les Sarziers is particularly delicious – hard enough to have some flavour and free from any trace of chlorine. But I find that I have acquired the French taste for the stuff out of the bottle, especially if it is carbonated. Perhaps it just seems more festive, like the lovely slogan for Volvic: l’eau qui chante et qui danse – a little bit of gaiety in your glass.